Hi and welcome back on this very first day of November. It's Heartfelt Creations Inspiration Wednesday and the last week that we'll be featuring the Young at Heart Collection. Next week we are launching another absolutely gorgeous collection! You're going to LOVE it! Today I have a card I created with the vintage bicycle to share with you. Card size is 5” x 7”. Cut Black cardstock 10”x 7” and score at 5” for the card base. Cut a black mat layer 4 1/2” x 6 1/2”. Cut a mat layer from the paper pad 4 3/4” x 6 3/4” and another one 4 1/4” x 6 1/4”. Ink the edges of both with black soot ink. Adhere the larger designer mat layer to the card base with Dries Clear Adhesive. Adhere the smaller designer layer to the black layer and then adhere them to the card base with 3D foam tape. Use a Quickie glue pen to dab the grass area and sprinkle with glitter. Cut another piece of designer paper 4 3/4” x 6 3/4” ink the edges with black soot and adhere to the inside of the card. Stamp the bicycle on white cardstock with StazOn black ink. Color with the Walnut brown, silver and black 3D stamp paints using a paint brush. Stamp the Wildwood Cottage flowers on paper from that collection with London Fog Ink, cut out with the coordinating die and shape using the Deluxe Flower Shaping Kit. Add Rajni Chawla’s Crystal Clear to the flowers, add prills to the centers. Stamp the leaves from the Simply Classic Cling Stamp Set on green cardstock with Olive Grove ink, cut out with the coordinating die, shape, spray with Sparkle Sheer Shimmer Spritz and add glitter. Adhere the flowers and leaves to the bicycle basket with Dries Clear Adhesive. 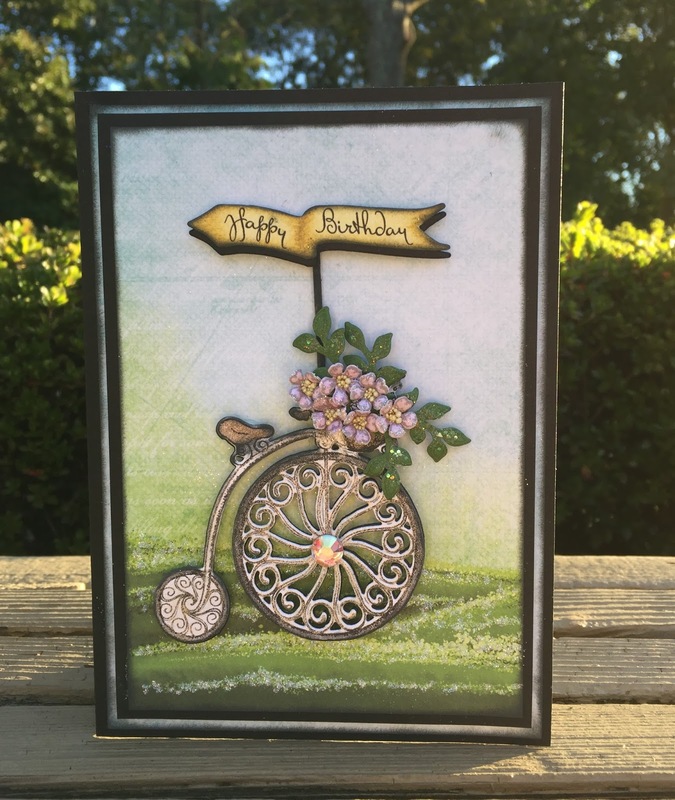 Adhere the bicycle to the card base with dimensional dots. Adhere the toothpick to the back of the sentiment flag then adhere the sentiment to the card with dimensional dots. Add a Swarovski Crystal to the center of the large wheel. Thank you so much for stopping by, I always enjoy your visit! What a lovely card! I love the bicycle and all those flowers. A very cute and gorgeous card! love the bicycle, great card Janet. Your bike is so cool! Love the wheels on that thing and the flowers are so pretty! Beautiful card!! Love the tiny flowers!